That looks lovely! We are in the suburbs, so no walkable groceries unfortunately. We're heading to Sprouts in a bit to get produce for the week. B (he's 4.5 years old) needs to take a special snack to share at church tonight and he wants to make fruit kebabs. I seriously love that kid, he makes me proud! Fruit is nature's candy bar, and fructose is toxic no matter where it comes from. (*) That said, I do still enjoy a small amount in the summer: Lemons and limes make refreshing drinks, and raspberries, blackberries and blueberries are great by themselves, with heavy cream, or coconut cream if you don't do dairy. (*) The antioxidants aren't there for your benefit, they're to protect the fruit from its own fructose. No need for antioxidants if you don't eat things that oxidize! if you like food/NYC you might like my blog The Native Tourists- try it out! 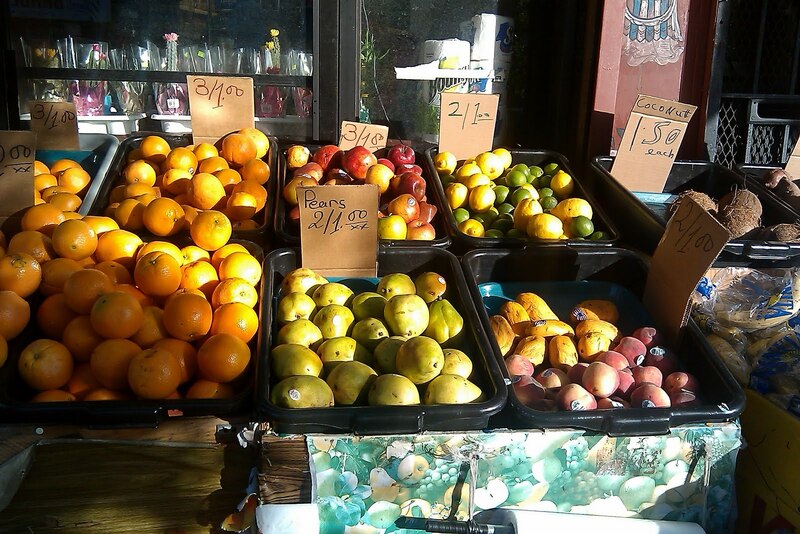 I was born & raised in Mexico, where markets selling fresh produce and meat are the commonality; that is one thing I miss the most about Mexico, being able to go to the market and buy all kinds of fruits. My parents always had a big basket with fresh fruit at the kitchen, just there available for everybody; coming home from school or work, the first thing to grab for a snack was a piece of fruit… we all learned to eat and love fruit, to this day, I cannot imagine not eating fruit for breakfast! I think it might be nice to remove the gum and candy from the register area and put fruit there. I'm in NYC, by the way. I actually had a "fruit vending machine" where I went for my undergrad (I went to RIT… Rochester Institute of Technology… got my BS in 2000). It also served raw veggies/dip, cheese and crackers, and healthy sandwiches. It was in the tunnel system under the library and was a SAVIOR for all those times I found myself studying at the library or working in my lab and forgot to eat dinner before the time the regular cafeteria closed. Don't get me wrong… there were still PLENTY of vending machines full of junk… but at least they had the one healthy one! I worked at a convenience store for a while and we had fresh fruit at the registers-that we constantly threw out because NO one wanted to buy it. People would rather have their donuts and cookies than bananas and apples. fruits great, the antioxidants is very important, because our body produce reactive oxidative species (ROS) daily, and a lot of them when we get stressed. many people also love to eat grilled and fried food which are the sources of ROS. i agree with you, we really need to go back in time. More than 40 years ago, some of my family members were fruit peddlers who rolled down the street with their wagon or open truck and stopped on each city block yelling "Fruit, fruit". People would come out of their homes and buy the fresh produce. Maybe it's time to take up the old traditions and bring the farmer's market to the people. In my last workplace, we had a refrigerated carousel vending machine where you could push a button to rotate the items around to the front, add your money, then open a little door to remove your food. They had microwave burritos and the like, but they also had locally packaged milk and OJ single-serve cartons, locally made sandwiches, and usually, apples and oranges. These carousel vending machines have been around for quite a while, and all it takes is getting your vending machine company to set one up! here in Okinawa, Japan we have fruit stands everywhere! I love it. There are also fish markets all over the place. Even in the 'country' where there are no convenient stores local farmers put up and umbrella and a small table made of a sheet of ply wood and four two-by-fours and have their fruit in baskets for you to buy. Some of the grocery stores even support local farmers and have their produce for purchase. Being an American, I find it hard to believe that we(as Americans) do not support our local farmers like Okinawa does. Everything is going to large mass produced fruits and veggies. I love that I can just walk about 10 mins down the road and there are three stands in any direction that I can pick from. Not only that but they have bakery's too. Fresh baked breads and cakes, and the breads and cakes have less sugar than that of American cakes and breads. agreed! I am surprised sometimes how difficult it is to find something fresh, healthy, and convenient to eat when I'm out. I've been trying for several years now to be more concious of what I eat and more in tune with my body & how food affects me. I've learned to recognize that often, my cravings are a warning signal: I need to eat the nutrients from whatever I'm craving, and I'm going to start feeling sick if I don't. One of the more frequent warning cravings I get is for bananas – I think it's a lack of potassium, since eating/drinking something that's not a banana but has a lot of potassium will usually make me feel better. If I'm not home, and don't want to buy a full bunch of bananas at a grocery store, I usually end up just getting OJ, because no where sells fruit – even places that do sell fruit (like Starbucks) often only sell it for breakfast. It drives me crazy! I was going to mention the carousel vending machines, too! Over the last two years my studies have taken me to a number of local schools and colleges and I often see one of those machines in the lunchroom. They can be filled with any food that takes well to refrigeration, so they are very suitable for many fruits as well as things like vegetable sticks. Some places, unfortunately, just stocked them with candy bars and cakes; others had healthier things like mhaithaca described. The technology is already there, and it's pretty simple. Maybe the market isn't there? Maybe we've become convinced that if we're going to have to get food from a vending machine, the choice will be a candy bar or a bag of chips, no point in asking for anything healthier? I was in Ireland this year, and one of the things that I noticed was that fruit was sold everywhere. And, not only was it readily available, it was always delicious. Unlike here where finding fresh fruit is difficult and when it is sold, it's often mealy or just tasteless. Whenever a vegetable doesn't have a desired taste you can add a tiny amount of fruit that kills the flavor without taking away from actually consuming the veggies and being healthy (pineapple and apple is really good for this). I visited London a couple of years ago, and there seemed to be a fruit stand on every corner. Here the best I have is a once a week farmer's market a couple of miles away out by the railroad tracks. It's good, but not a "just passing by", convienent type place. I guess to make a daily fruit stand profitable, it would have to be in an area with a dense enough population so you get lots of people walking by every day, causing a high enough turnover of product. And those people would have to actually want to BUY the fruit instead of junk food. If I moved to London or another European city where I had to walk everywhere I went and there were fruit stands on every corner, I'd probably lose some weight. Just thought of another idea to go w/that tuna melt which would up the veggie factor a bunch…..gazpacho. All the posts about yogurt made me think of it because sometimes I make it super spicy and plop some plain yogurt on top. I'm hooked on Fage 2% plain Greek yogurt. I think a couple of others have mentioned a preference for Fage 2% in this thread. I've tried Fage fat free and I find it a tad austere. I've tried Fage full fat yogurt and find it too rich….kind of like drinking a glass of half & half or cream when what you really wanted was a refreshing glass of milk. Love that Fage 2%! Nice & thick. Just the right amount of fat for my tastebuds. No funky ingredients. Just yummy milk and busy little yogurt cultures. It's a thing of beauty. I seems to me that it should be feasible for school food vendors to make up batches of soup, freeze them and then the soup would be thawed and reheated at the school. I put yogurt on lots of winter soups like chili, lentil, split pea, pumpkin, and butternut squash. A yogurt topping could be offered to school kids with their soup. In fact, why couldn't the food vendor or the lunch ladies (I hope no one finds that term offensive) make the yogurt to save on cost and control what's in it. I know this type of change would mean more work for the lunch ladies and there would be training involved but I wish someone would do some sort of study on how much something like this would cost and what exactly it would entail. We're missing out on such a huge opportunity to improve kids' health by not doing these types of things. It saddens me that we've let the situation get this far and I'm angry that so few people seem to grasp how important this problem is. And who are the brain surgeons that decided to nix recess? Whoever you are, thank you very little! Actually, I don't really care who made this bad decision. Let's just fix it. Mrs. Q, does your school have gym class or did that fall victim to the brain surgeons, too? Also, we used to have health class when I was a kid back in the Ice Age. I seem to recall that it was taught by the gym teacher so maybe if gym class is gone so is health class. Nutrition was a major topic in health class. I lived in a suburb of Taipei growing up (Hsinchu) and we lived at the junction of downtown, university neighborhoods and residential neighborhoods. There was a fruit stand on EVERY BLOCK. They were like Starbucks are now. Very comforting to know that a piece of fruit is less than half a block away. I would love to see more of those in America! Back in the early 70s, we lived in a larger US city and had the pleasure of weekly or so visits from a mobile grocer. He had an old, large wooden cart that he sold his fruits & veg from. The kids in the neighborhood would follow along as the moms came out to shop and I think we all looked forward to his visits…until the big chain grocery stores popped up all over the city. The man offered scissor sharpening as well (because back in the day, we used to keep things). Sadly, his services weren't in demand mid to late 70s and he gave up his route. That early exposure to fresh fruit and vegetables in an urban setting made me search out farmers markets and the like later on while living in the burbs.